Albert Terrace is a small crag in suburban Christchurch. It is one of the very few crags that you can bus to and the only one on the flats of Christchurch City itself, which mean it has the easiest and quickest access of any crag on the Port Hills. All the climbs are under grade 20 (most in the mid teens), so this is a good crag if you are making the transition from the indoor wall to your first outdoors experience,although the rock is quite polished and gets covered in pine needles and dirt from above. You will need a maximum of eight quickdraws (six for the climbs, if leading, and two for the anchor rings at the top). All climbs have double rings at the top which makes it a user-friendly crag, but please, if top roping, do not take the 'European approach' and run your rope straight through the rings as this creates wear and tear. Please use two carabiners. 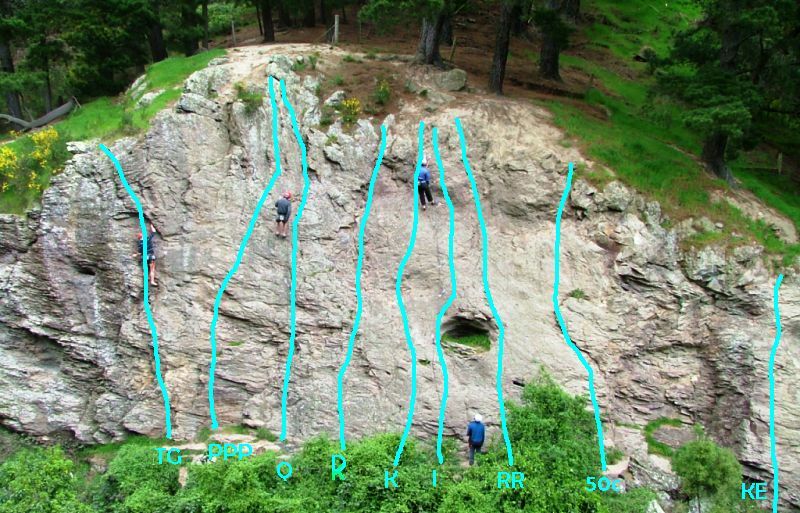 Albert Terrace was first climbed on in 1997 by Ross Cullen and Bob Blackburne and was originally a trad crag. The crag has since been totally retro-bolted. DRY TOOLING OPTIONS: Please note also that in the first cave opposite the main crag there are three bolted routes put in for dry tooling practice. Grades unknown. Albert Terrace is in the suburb of St Martins. If travelling down Wilsons Road, go straight ahead at the roundabout junction with Centaurus Rd (a Mobil service station will be on your left), and travel down Albert Terrace itself until the road ends at the last house and just before a gate. The main crag is visible from here, a few hundred metres on the right side of the valley. From the car park it is a 5 minute walk on the lower valley track. Nice climb, lots of jugs. You can either finish on the left or right side of the arete. Climb obvious natural breaks 3m left of Defenced. The four bolts make this an attractive leader climb. The central gully line. The old wooden post from the remnant fence lies at the bottom of the climb. Three metres right of Defenced. Glide up the apron on incut holds to reach a good stance at the top. There’s a nice right handhold for the mantle over the lump to the right of the gully. Two metres right of Kinny, climb up past the left edge of the giant paua shell then slightly left to reach the top stance. Ascend the bulge, place good protection in the gully and exit. Just right of big cave, nice moves. Up and over a small overhang to reach the left edge of a C-shaped crack, then straight up to the top. Use juggy holds in and by a crack to reach a ledge before the tackling a final bulge. Climb the steep crimpy face directly past the bolts while avoiding use of the crack / corner either side of you. Otherwise a grade easier. Climb the steep corner on sharp holds (avoid using the ledge on Leone's at 2/3rds height) and take the final overhang on its left. Bridge up the corner (using the first 2 bolts of "I Bit My Tongue") and move right through the bulge to a ledge. The rock is suspect. Good incut holds up the left edge of the attractive buff coloured block. Nice incuts up the centre of the buff coloured block to merge with Kopu’s Edge near the top. Edited from information written by Ross Cullen and originally hosted on the web by John Davis. And Port Hills Climbing has 34. But Ross, no one moderates ClimbNZ and information is not being discarded. It relies on someone posting the climbs. The ones listed are known because they are all (retro)bolted, but no one has done the others except you and me, and many people don't have access to the information. 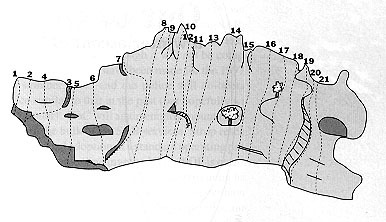 The list of routes above has only 14 climbs, but the diagram at the top of the page has 21 climbs. The article in Climber # 22 on Albert Terrace has information on 33 climbs. Why is information being discarded from climbnz?